With the Australian Open, the 2015 tennis season began with its traditional bang, and delivered tennis fans what they had been waiting for since the US Open. And as usual, the Australian summer delivered it’s fair share of surprises under the blazing sun. The first and most momentous of these shocks came much earlier than anyone was expecting. Since 2001, Roger Federer has consistently made it past the third round of the Australian Open. Many of these times, it was simply the third match that he needed to win of the seven required to deliver the title. However, this year, low ranked Italian, Andreas Seppi, felled the Fed Express in the third round. With a wayward serve and many more unforced errors than he typically delivers, Federer could only take it to four sets before succumbing. In a tournament that often delivers a dashing run deep into the second week by an unheralded player, Seppi was himself toppled the very next round in a pulsating five-setter by rising star Nick Kyrigos. The hometown hero combined his trademark blend of flair and power serving to win. Kyrigos was beaten by Czech, Tomas Berdych, who achieved the rare feat of knocking out Rafael Nadal before a semi final the next round. All of this had the effect of opening up the draw for Andy Murray and Novak Djokovic to advance through, but not before Djokovic was once again pushed to five sets by defending champion Stanislaw Wawrinka. In a repeat of two previous Australian Open finals, how did Djokovic maintain his perfect Australian record over the Scotsman? As your online tennis coach, I have pinpointed the following areas. 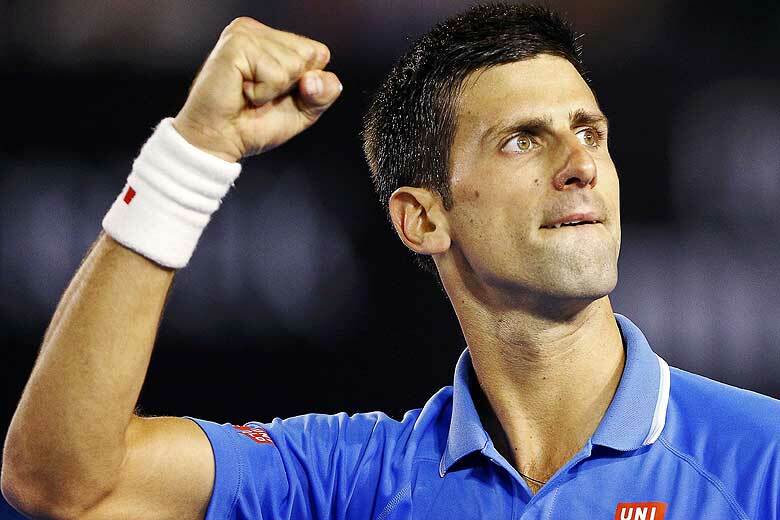 Mental Game – It became apparent very early in the match that Djokovic was having some physical discomfort. When the previews for the tournament were written, the big question many had was whether Andy Murray’s troubles with injury in 2014 would prevent him from reaching his full potential so early in the season. However, it was the Serbian who struggled with physical conditioning in the final earlier. This posed a huge problem for Djokovic, as his strength as a player stems from an ability to make his player play one or two more shots each rally though his superb court coverage. Djokovic was unsteady on his feet, which led to him falling over and stumbling on several occasions. However, it was Andy Murray who was the major loser from these events. It quickly became apparent that the sideshow occurring on the other side of the net distracted Murray. Rather than focussing on his own game, he began playing as though he could simply parry the ball back and the injury would complete the job. He was aware of the issue too, repeatedly being heard saying “concentrate” to himself. On the other side, Djokovic was able to harness his reserves of mental strength to hold on through the tough moments and win points. As he kept returning balls Murray became more flustered and eventually Djokovic’s physical ailments passed. As more unforced errors crept into his game Murray became increasingly frustrated, which in turn led to more errors. This quickly meant that Murray’s grip on the final slipped. Service Game - It was noted by veteran commentator Jim Courier that Murray’s average second serve speed was lower than both of the competitors in the previous nights women’s Australian Open final. This served to highlight the biggest weakness in the Murray game. His second serve averaged around 120 km/h, which allowed Djokovic to stand well into the court and attack the serve. In terms of statistics, Murray won just a third of points on his second serve, compared to over 60% for Djokovic. In comparison, Djokovic turned his service game into an asset this tournament, being broken only once on the way to the semi-finals. He consolidated this with a low unforced error count on serve, double faulting only once in the four set final. In an otherwise even Australian Open final, Murray’s mental lapses led to the loss of several key points. Some were when he had the opportunity to break his strong serving opponent, but many more were when he was under pressure and looking to defend his own lead or serve. Under Ivan Lendl, Murray was able to harness his emotions much better and spent less time distracted, which greatly benefitted his game. It remains to be seen whether Amelie Mauresmo can deliver similar results with the enigmatic Scotsman. Eye-catching performances at the Australian Open from Kyrigos, Grigor Dmitrov, Kei Nishikori and Wawrinka coupled with emerging frailty in Nadal and Federer in particular opens the door for the most evenly contested Grand Slams in years. The next slam is the Roland Garros. Nadal has turned Roland Garros into a fortress and it is there he is best placed to win another Grand Slam. But with the narrowing of the distance between himself and the chasing pack, he is no longer the clear frontrunner that he once was. From "Australian Open Final 2015: My Post Match Analysis" To "How To Play Tennis Efficiently And Become A Better Player"